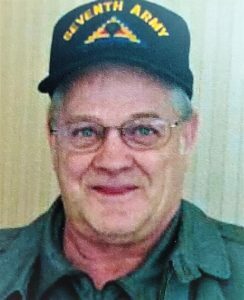 You are here: Home › Whitehall Times › Obituaries › Obituary: Frank E. Bessette Jr.
W hitehall – Frank E Bessette Jr., 74, of Route 22, Whitehall, passed away on January 11, 2019 at his home following a long illness, surrounded by his children. He was born October 3, 1944 in Ticonderoga, N.Y. to the late Frank E. and Rose (Wood) Bessette. He was a great father, wonderful grandfather, and an all-around great guy, he would help anyone in need, and he would give anyone the shirt off his back who needed help. He served in the U.S. Army during the Vietnam War from 1966 – 1972, where he was honorably discharged in November 1972. He was a proud Veteran and a longtime member of the Whitehall Legion Post 83, where he served on the color guard team and helped honor many deceased veterans. In his early years Frank worked at the Davis Street Metal Machine Shop “Production Devices” for 15 years. He later went on to work for Skyline Home Inc., as a roofer for 25 years and retired from there. Besides his parents, he is predeceased by two sisters; Alice Bessette Penor and Kay Bessette Golden. He is also predeceased by two brother-in-laws; William ‘Billy’ Golden and Fredrick Foster. Survivors include his sister Arlene (Fred) Foster of Lexington, Kentucky, his children: Tammy Eagan (fiance Wayne Angus) of Whitehall, Frank (April) Bessette III of Whitehall, Warren (Krista) Bessette of Brant Lake, N.Y.
Grandchildren: Ashley Eagan, Tyler Eagan, Justin Eagan, Frank Bessette IV, Dylan Touchette, Deven Touchette, Warren Bessette Jr, Wyatt Bessette, Pyper Bessette. Several nieces, nephews and cousins, also Keegan Brazzale and Arthur Eagan. A special thank you to April Bessette for taking care of ‘Pops’, and to the High Peaks Hospice Nurses. At the family’s request there will no calling hours. Burial will held in May, at the Gerald H. B. Solomon National Cemetery in Saratoga, at time and date to be announced. Arrangements are under the care of the Jillson Funeral Home Inc. 46 Williams Street, Whitehall, NY.